When you read the water statistics from around the world it is startling how many people are still in dire need of water, how many people lack access to clean drinking water, how many people are still dying from water-related illnesses, how far the average person walks to fetch water for their home, how many days of work and school are lost due to water-related issues, and how many areas of the developing world are still without water. 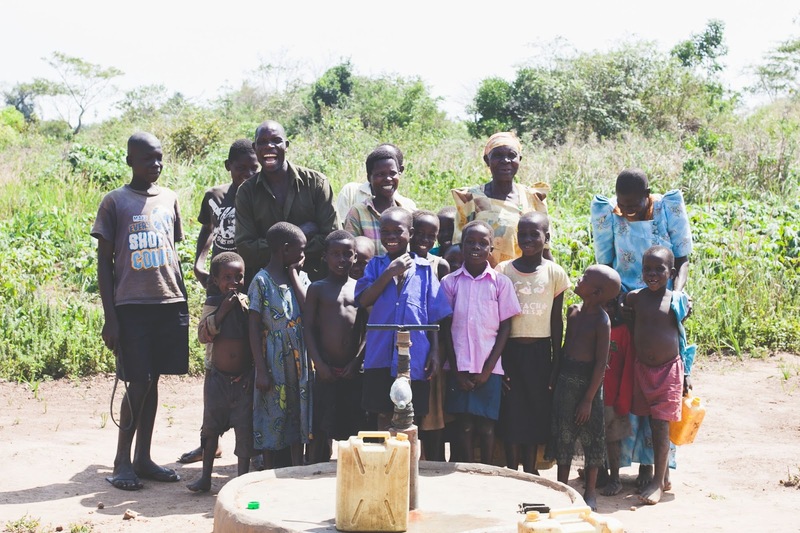 Thank you for supporting efforts to bring safe, clean drinking water to the people of Uganda. God is good! Nearly a billion, 884 million people do not have access to clean and safe water. 37% of those people live in Sub-Saharan Africa. The average container for water collection in Africa, the jerry can weighs over 40 lbs when full. 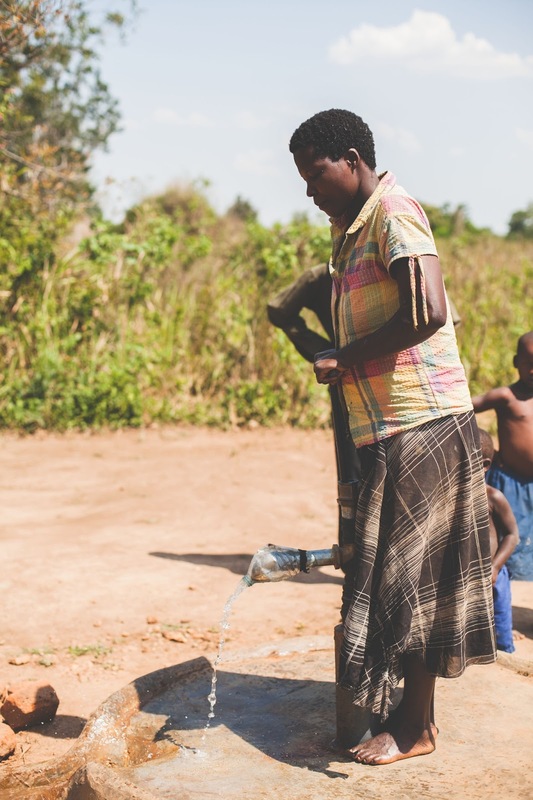 Almost two-thirds, 64% of households rely on women to get the family's water when there is no water source in the home. I wanted to post this for Colin. 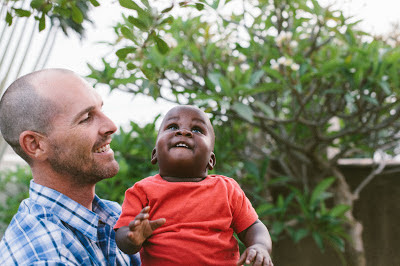 He has a "little chap" that follows him and he is setting such a wonderful example for him. Silas and I are so blessed to have him in our lives and we love him with all our hearts. "The Little Chap Who Follows Me!" I want to tell you about a wonderful man and friend. His name is Sterling Hall. I first met Sterling when I was living at the Texas Agricultural Experiment Station located about 30 miles south of Sonora, TX. I was involved in prescribed burning and was trying to get certified to conduct prescribed burns throughout the state of Texas. Sterling was in his early teens at the time - probably around junior high age. He came up to me at a field day at the Station and wanted to know more about prescribed burning and see if he could come and help out on any upcoming burns. About a week later we had a burn scheduled and so I let Sterling know and he came out on the day of the burn. If I remember correctly it was not one of my better burns, I had not planned it as well as I should have, and we had a number of small spot-fires that got over into the neighboring pasture. It was a lively day, but Sterling worked just like anyone and acted like he was an old pro at burning. So that is how I met Sterling and where our relationship began. Over the next few years we spent much more time together, Sterling helped out on a number of burns, I was able to help him on a science project, we spent time at his home with his family, he interned on a neighboring ranch for a summer, and we did a lot of riding around on the Polaris Ranger on a lot of different ranches. I married Ronnie and she and Sterling hit it off and became fast friends. Sterling always showed a lot of maturity. Even when he was in junior high he didn't act like a typical junior high kid to me, he acted like a man. Sterling was always very active and involved in organizations, clubs, service projects etc. I never really got involved in much during my high school years so I really respected Sterling for having that desire to serve and be involved in bettering your community. Sterling was always polite, was respectful, exhibited good wholesome values, showed an eagerness to learn, was excellent company to be around, and is just plain likeable. He came from a good Christian home and had a wonderful close-knit family. It was always super easy to like Sterling and be his friend. One of the highlights of being Sterling's friend was when we were able to see him receive his Eagle's Scout badge during his senior year of high school. One day a few months ago we received in the mail a package from Sterling and in it was some diapers and some stuff from Ronnie, some books and things for Silas, some treats we can't get here, and the best thing of all was a book written by Sterling himself. The book was titled In My Perspective. I had no idea Sterling had written a book and when I opened it up to read it I was even more surprised to see that his book was dedicated to his family and to me and Ronnie. Then you turn the page to find that the book is about the friendship Sterling and I shared. It was truly one of the most touching and moving things I've ever received. I had no idea years ago when I first met Sterling that our friendship would be as impactful as it was. As I read the book I was incredibly humbled. You never know how your life affects others. It made me more mindful of the impact we have on others around us, and how what we do and say when our guard is down influences others. Sterling was very flattering in his book and I am not sure I can live up to the Colin he writes about. Sterling went on to talk about how he was inspired by our coming to Uganda and as a result has a greater desire serve others and to serve his country. He also says he learned from our friendship how to be obedient to all God calls him to do. I was blown away by Sterling's words. Sterling told his account from his perspective, but his words put a few things in perspective for me. For one, each of us at this very moment is influencing others. Folks are watching us to see how we handle certain situations, how we treat others, how we react and interact. We have the power to influence others for good or bad at any given moment. I never really gave it much thought before as to how I might be influencing Sterling - I was just having fun with a friend, but as I can see from Sterling's book, Sterling was watching and observing how I treated Ronnie, how I handled tough situations, if I really lived a Christ-like life or if it was all talk, was my faith real and did I have a heart changed by the power of God, was there joy in my life, did I value our friendship, how was I really. Ronnie and I were both incredibly moved by Sterling's account of our friendship. It was sad in a way to read about all those good times with good folks and to not be able to share those same moments anymore. But it was also an opportunity to rejoice because God allowed us to have that time, to do all those fun things, to talk about things that matter, to get to know one another and to share our lives with each other. I am grateful God blessed us with Sterling. His friendship was and still is a blessing. I greatly respect and admire Sterling for the man he has become. His parents have done a fantastic job of raising Sterling to be a man of integrity. It is an honor to receive such a touching book and an honor to be friends with Sterling. Sterling - please know that we love you and pray God's blessing on you and all your endeavours as you are obedient to each and everything He calls you to. I thought it was about time for an update on the water well drilling. In the last month we were able to successfully drill 4 new wells - 1 in Pingire and 3 in Obulle. We are so excited about what the future holds for this ministry. We have been drilling now in Uganda for about a year and a half now and we are only just now figuring out how best to drill in this environment with this equipment, and through these formations. We are still learning and tweaking things to fit our situation. God has been faithful and has certainly kept us as we've gone through this learning period. He has kept our equipment from breaking, our morale, our strength, our crew, etc. We are so excited for the dream of owning your own well to catch on in Obulle and Pingire. With each "test well" we drill the village begins to see that dream take shape in their minds, and one day they too will only have to travel a few feet for water as opposed to kilometers. We will start a new well in Pingire on Monday. The drilling has been going so well that we haven't taken the time to stop and get good pictures of the completed product, but I hope to do that next week sometime so that you can see the happy families who are praising God for the gift of water He has given them. This last well that we completed was one of the most difficult wells we've faced. It took 3 days to drill the first 1 meter. We hit a hard marrum rock almost immediately and then just had to beat on it for the next 4 days before we got past it. All in all it took 2 weeks of difficult drilling to get down into good water so we could case the well. Yesterday we were rewarded for our efforts as we watched the family pumping water from their very own well. Thank you for your prayers and support. 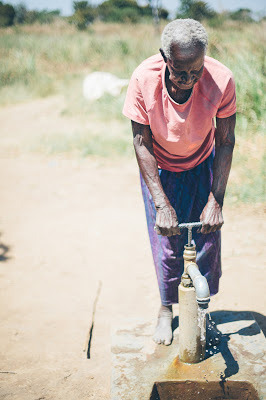 We covet your prayers and without you Water For All International could not continue serving the rural poor, we would not be living this dream life that we get to live, and many would go without water. So thank you for lifting us up in prayer and for doing your part and being obedient to God's calling on your life.